Jaguar I-PACE makes its regional dynamic debut in Riyadh, Saudi Arabia ahead of the 2018-2019 Formula E and I-PACE eTROPHY Championships. Eleven Jaguar I-PACE eTROPHY racecars will take to the grid at the world’s first international championship for production-based electric cars on Saturday. Guests to the race have the opportunity to drive the all-electric Jaguar I-PACE for the first time in the region through the Smart Cones driving challenge. Riyadh, Saudi Arabia, December 15, 2018: Arguably the most anticipated car of 2018, the award winning, All-Electric Jaguar I-PACE made its Middle Eastern debut yesterday at the showroom of Jaguar Land Rover’s official retailer in the Kingdom of Saudi Arabia, Mohamed Yousuf Naghi Motors Co, in Riyadh. As the key highlight in the build up to the first ever Formula E and the Jaguar I-PACE eTROPHY Championship series, races to be held in the Kingdom, VIP and media from across the region gathered during the Jaguar Racing Re:Charge event at the Jaguar Land Rover Riyadh showroom, where they mingled with Panasonic Jaguar Racing’s drivers, Nelson Piquet Jr. and Mitch Evens, as well as drivers from the local Saudi team Ahmed Bin Khanen and Bandar Alesayi , who are racing in the eTROPHY series. The opening round of the 2018-2019, all-electric racing series starts today in Ad Diriyah, Saudi Arabia. 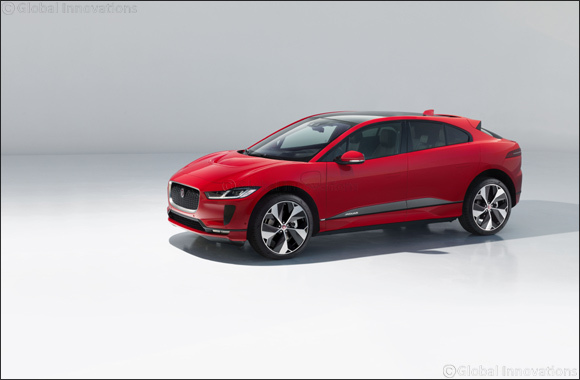 Due to arrive in the coming eighteen months, the Jaguar I-PACE delivers thrilling Jaguar power and dynamics with zero tailpipe emissions, while maintaining the true Jaguar sports car performance, in the form of an all-electric, five-seat performance SUV. Bruce Robertson, Managing Director, Jaguar Land Rover MENA Region said: “The Jaguar I-PACE represents so much more than another new model for us. It is the trailblazer in the global EV revolution of the car industry, setting the standards for other manufacturers to follow and we are very excited to see the I-PACE making its Middle East debut here in Riyadh, Saudi Arabia. The new Jaguar I-PACE eTROPHY race series will see 11 I-PACE eTROPHY racecars taking over the 2.495km race track, which starts and finishes in the ancient surroundings of Ad Diriyah, Saudi Arabia. The championship showcases the link between Jaguar’s involvement in motorsports, the development of Jaguar’s road cars and the future of electrification. The guests to the Formula E and I-PACE eTROPHY races will be given the exclusive opportunity to drive the all-electric Jaguar I-PACE for the first time and to experience its dynamic handling and responsive throttle through the Smart Cones driving challenge, for a chance to win two tickets to Jaguar's Ice Drive Academy in Sweden. Designed from the beginning as a dedicated electric vehicle, Jaguar I-PACE offers a bold aero-efficient design with perfect 50:50 weight distribution and interior space from the segment above. Its twin Jaguar-designed motors drive all four wheels to offer 400PS and 696Nm of torque. A 90kWh Lithium-ion battery delivers 470km of range and a 0-100km/h time of 4.8 seconds, while rapid public charging supplies 80% capacity in just 40 minutes and a 15-minute burst returns a 100km range. Smart Settings use artificial intelligence algorithms to tailor I-PACE to individual driver preferences and customers have peace of mind with an eight-year battery warranty and 21,000-mile (33,800km) / two-year servicing. The I-PACE has received over 30 awards globally since its reveal, including German Car of the Year, Norway’s 2019 Car of the Year, BBC TopGear Magazine EV of the Year on the international stage while in the MENA region, Arab Wheels has recently nominated the I-PACE as the Arab Wheels EV of the Year.